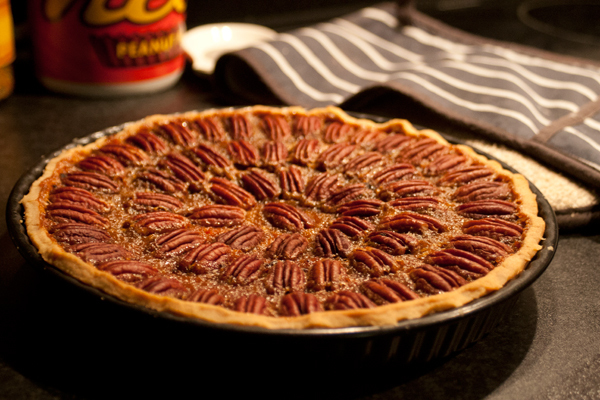 Back in September, I attempted to make a pecan pie for the American pie challenge on Great British Bake Off. After a miserable failure, I vowed to stick to my mother’s recipe for all future pecan endeavors. After a few weeks of waiting for mom to finish traveling, I finally had a copy of her recipe arrive in my inbox. So I made myself some pastry and began my second attempt at this troublesome tart. I whisked up the filling and carefully laid in the pecan halves, one by one. Then I held my breath as I anxiously placed it in the oven, gently sliding it into the center and praying that disaster didn’t strike a second time. Boy had I wished I had done it the right way the first time around! Beautifully dark golden brown and crisp – I’d call this pie a success as well as true American classic! 1. Preheat your oven to 450°F (230°C). Line your pie dish (preferably one with a removable bottom, it’ll make your life easier) with the shortcrust pastry, then gently prick the base and sides with a fork. Lay a sheet of aluminum foil over your pastry, then fill with baking beans and place in the oven to bake for 5 minutes. Carefully remove your baking beans and foil, then return to the oven for another 2 minutes. 2. In a saucepan over medium heat, combine the sugar, corn syrup, and butter. Stir the mixture constantly until the sugar dissolves and the butter melts. Once everything dissolves, remove the pan from the heat. 3. Once the mixture is slightly cooled, whisk in the eggs, vanilla, and salt. Once everything is mixed together, pour into your blind-baked pie crust. 4. 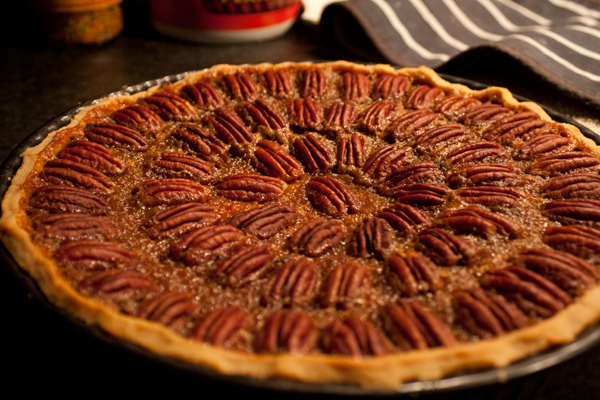 Gently arrange the pecan halves on the top of your mixture, arranging in concentric circles – starting from the outside and working towards the center. 5. Reduce the heat of your oven down to 325°F (160°C). Carefully place your pie in the oven and bake for 55 minutes until set. For an added touch, try drizzling over some melted chocolate or make a praline whipped cream using 1 cup whipping cream, 2 teaspoons praline liqueur, 1 teaspoon vanilla, and 1/4 cup icing sugar – mix them all together and beat with an electric mixer until you have your whipped cream.